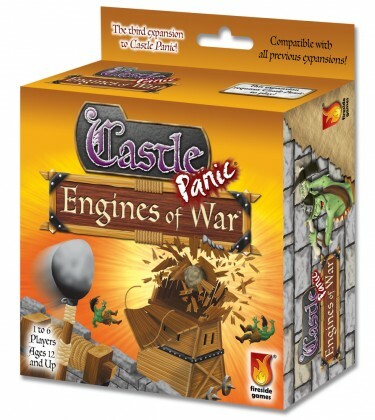 Castle Panic: Engines of War is an expansion for Castle Panic by Justin De Witt, published by Fireside Games. It is for 1-6 players. This expansion adds several new pieces of equipment that can be used by both players as well as monsters. The expansion also introduces new monsters to threaten the players with, as well as encampments that change up how monsters enter the battle. For more information on the base game of Castle Panic and how to play it, please follow the link below. To begin with, it should be noted that the objective of the game remains the same. All the monsters must be defeated and the castle must have at least 1 tower standing for the game to be won. The expansion can be played with Castle Panic by itself or with the base game and any of the other expansions. In this review, I’ll only be discussing how to play the expansion with the base game, without any of the other expansions. For more information on how to setup and play with them, please check the rule book. Setup is a bit different. Let me explain how to setup using the expansion and base game. First, place the board in the middle of the play area. The walls and towers should be set up on the board just like for Castle Panic. The Keep token is placed in the center of the castle. The Engineer and Task tiles are placed beside the board, separated from each other. The many different equipment tokens are placed near the board for ease of play. The brick and mortar cards are removed from the original deck and replaced with the new cards from the expansion. The resource deck is created by shuffling together the new brick, mortar, rope and wood cards together. This deck is then placed face down near the board. Six orc tokens are removed from the monster tokens and placed near the other tokens. The following tokens are also removed from the base game and returned to the box: 3 goblins, 2 trolls, 2 giant boulders, 1 red monsters move, 1 green monsters move and 1 blue monsters move. 3 Goblin, 2 orcs and 1 troll are placed on the board in the archer ring the same way as in the original game. The new monster tokens from the expansion are added with the remaining tokens and placed into a face down draw pile. The Castle cards are shuffled together and each player is then dealt a number of cards based on the number of players. The remaining Castle cards are placed near the board. The first player is chosen and play now begins. The order of play for the game remains unchanged. However there are a few minute details that should be pointed out. During the draw up phase, players are able to draw from either the castle deck or the resource deck. In the discard and draw phase, they are able to discard any of the card types; castle, resource or wizard (included in a different expansion) and draw from any deck. Players are then able during the trade phase, to exchange any cards in their hand for any cards in another player’s hand, regardless of the type. In the play cards phase, players can play any card type they wish. Of course this expansion includes new monsters and effect tokens so those will have their own way of resolving based on the rules included in the rulebook. Now then let me explain a little bit about each new addition that this expansion adds to the game. There’s the resource deck which includes rope, wood, brick and mortar cards. These are used by the Engineer to built equipment. 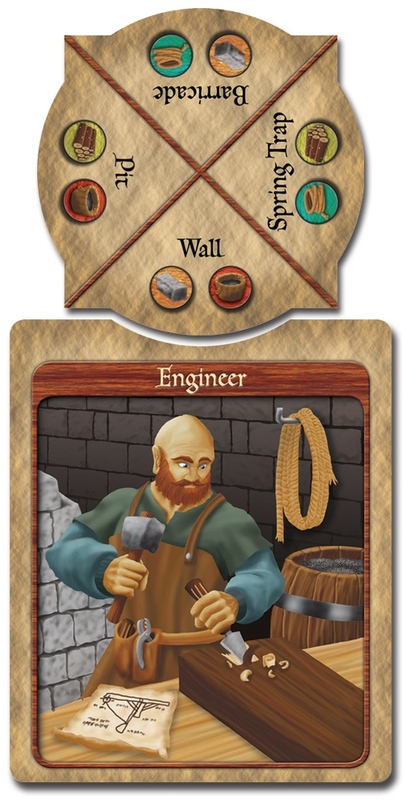 For him to craft equipment, the players have to commit resource cards of the correct amount. His abilities are used during the play cards phase. First the player(s) chose which equipment he’ll be building. This can change as long as no cards have been assigned to the task. The task tile is fitted into the notch of the Engineer board showing what he’ll be building. Once the correct amount of resources has been committed, the equipment is built. The engineer is able to build both field equipment and castle equipment. Field equipment includes barricades, pits and spring traps. Castle equipment includes ballista, catapult, keep and walls. Barricades are like walls, however they also block flying monsters. Pits damage monsters that move into them but not flying monsters. Spring traps acts like the card, “Drive Him Back”, moving a monster back to the forest ring. These don’t affect flying monsters either. The Ballista and Catapult damage monsters. The Ballista deal damage to a targeted monster and then it also damages every monster in the same arc behind it. The catapult does 3 points of damage to a single space but those points may be distributed between monsters in that space. Both the ballista and catapult damage flying monsters. The keep is where the ballista and catapult are placed. If it’s destroyed, so too are any catapults or ballistas that were placed on it. Walls are simply the same as walls in the original game. It should be noted that the monsters also have equipment that they can use. These powerful siege engines included the siege tower, war wagon and battering ram. These siege engines are equipped with 2 orc tokens that were set aside during setup and are moved together as one unit. The engine protects the orcs beneath it from most damage. The siege tower is used to breach walls and prevents new walls from being built. The war wagon is an armored transport that protects it’s crew while it moves towards the castle. It moves a bit differently from other monsters or equipment. It moves 1 space forward and then 1 space clockwise or counter clockwise based on a die roll. The battering ram destroys walls and towers easily. 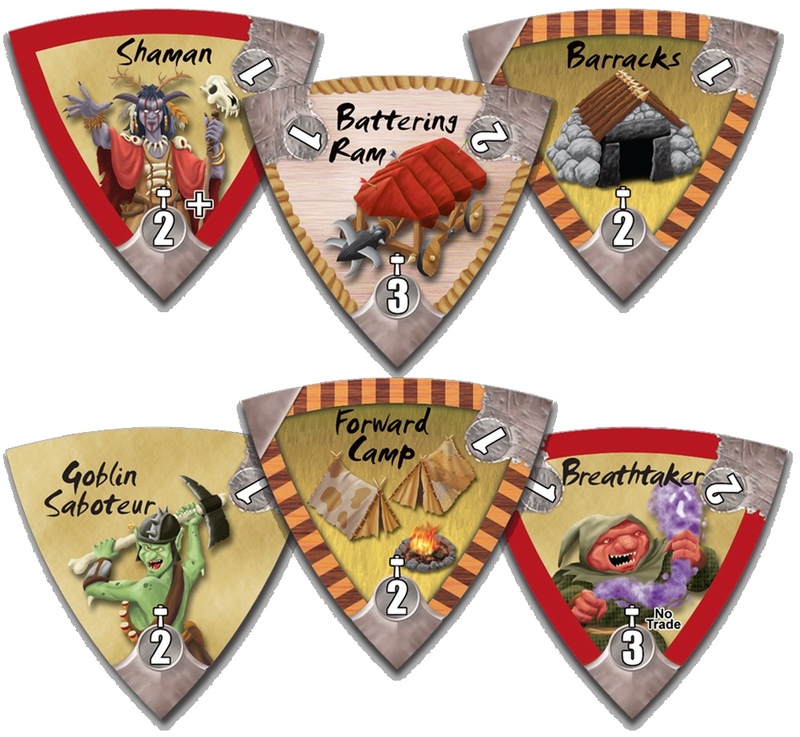 There are also some monster encampment tokens that change up how monsters enter the board. There are barracks and forward camps. Barracks allow new monsters to enter the board in the same forest space that the barracks is located. The forward camp is placed on the intersection of 2 arcs of the same color. Forward camps allow monsters to move immediately into the archer ring when placed in either arc of the same color. The forward camp can even stack with the barrack to really cause chaos. This expansion has some really great looking pieces to it. There are lots of cool looking tokens, tiles and cards. There are tokens for the Keep, the Engineer and the tasks that he will be working on. Thee are tokens for spring traps, pits, barricades, catapults and ballistas. There are new monster tokens with siege weapons and new and more dangerous monsters. There’s a new deck of resource cards. There are reference cards for helping you remember what to do. All of these are packed into this small little expansion box. The artwork on each piece models the art from the base game and looks great with it. Several of the new pieces like the catapult will slide onto other pieces and give a 3 dimensional aspect to the game, like the walls and towers did with the base game. This is another great thing about the expansion that I like. I like that you get drawn into this castle’s dilemma through the various pieces. The new pieces really give that fantasy world depth. I love it. Needless to say, the components are grade A. You will not be unhappy with them. The rulebook for this one is a bit long, as in both size and length. Size wise it’s dimensionally long like the rule book for games like the Machi Koro expansion or Diamonsters. Length wise it’s also a bit longer than I would have expected for a simple expansion. However once you delve into it’s depths, you realize that there’s actually a lot to this expansion. There’s a page front and back that explains all the different ways to set up the expansion with the base game and/or any of the other expansions for Castle Panic. From there all the different aspects of the game, from the resource deck and the Engineer to the different types of equipment and new monsters and their siege weapons are discussed. Overall the book is 16 pages long. Not really large, but like I said, bigger than what I expected. Still, there’s lots of great information as well as tons of awesome pictures and examples of gameplay. The book has even been folded in half so that it fits inside the handy little box the expansion comes in. It fits nicely inside the insert for the base game. Overall, I’m happy with the book and find it helpful and well done. This is a really great expansion to an already great game. It amps up the tension that the original gives you quite a bit. The new equipment is really cool. I like having the new ways to attack monsters, especially the ballista. That thing is just deadly. I also really like how the resource deck is done now. It makes it where you don’t have to worry about those cards unless you just absolutely want to build something. Also makes it a bit easier if you’re trying to rebuild a wall or create a new piece of equipment. I really like the Engineer and how that other players can contribute to the equipment you’re trying to build as well. That’s one thing that I found difficult in the original game. Seemed that you sometimes had to just wait and hope for the best or try to trade to get the other piece you needed to build a wall. So glad that they’ve updated this aspect of the game. On the monster side, you have to worry about their new equipment as well. I find that the encampments are especially difficult. If they manage to double up on you, you’ve pretty much had it. Those new siege weapons are nasty and can really mess up your day. The new monsters aren’t too bad, except for the shaman, his ability to heal monsters every turn is frustrating. I recommend you take him out as soon as possible. As you can see, the game has a lot more options and things to consider than in the base game. Fans of the original Castle Panic will really enjoy this expansion, especially if they’re looking for a new challenge. It’s not a must have expansion but it’s still one that as a fan of the game, I’m happy to have. I really enjoy it and find it to be even more challenging. I highly recommend this one. Castle Panic: Engines of War is an expansion for the already great game, Castle Panic. It adds lots of new equipment for both the players and monsters, as well as introducing new monsters, the engineer and the resource deck. As far as play time, the expansion doesn’t add a whole lot more time. Most game sessions are still around the 45 minute mark, maybe an hour. The components are very much in tandem with the ones from the original game. The artwork is very similar so you won’t have anything standing out and looking out of place. I really like the new equipment and think that it really adds a new depth to the game. Fans of the original game should really enjoy this one, especially if they’re looking for a new challenge. I wouldn’t call this a must have but it’s definitely one that I’d highly recommend. I really enjoy it and think it’s a lot of fun. But seriously, watch out for that shaman. This entry was posted in Reviews and tagged board, board games, card, card games, castle, castle panic, de, engines, engines of war, fireside, fireside games, games, justin, justin de witt, panic, war, witt. Bookmark the permalink.